March 28 - 7:30 p.m.
Gioachino Rossini's The Barber of Seville is called one of the funniest, most frenetic operas ever composed. 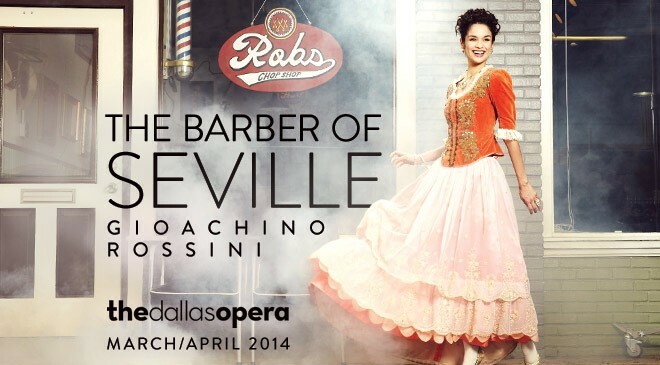 Dallas Opera favorite Nathan Gunn plays the scheming barber and acclaimed mezzo-soprana Isabel Leonard plays Rosina, the gorgeous gal everyone is after. Saturday, March 29 - 11:00 a.m.
Love the idea of the Great Trinity Forest tour, but want to enjoy the outdoors a little closer to your high-rise? From 11:00 a.m. - 1:00 p.m., the newly renovated Griggs Park is hosting a special community day complete with good tunes and good food. A fun outing for the whole family, even for your pets. Be sure to tell everyone you're going by RSVPing on the Griggs Park Facebook page. Sunday, March 30 - 12:00 p.m. Grab your boaters hat and set your pocketwatch back to the Roaring '20s. From 12:00 p.m. - 4:00 p.m., the Singapore Slingers and Dallas' Art Deco Society are hosting their own version of New York's Lawn Party at the Dallas Heritage Village. Expect the live musical performances, vintage photo opportunities, Model A Fords, a costume contest and Carnival Baker's handmade ice cream. Proceeds benefit the Dallas Heritage Village.